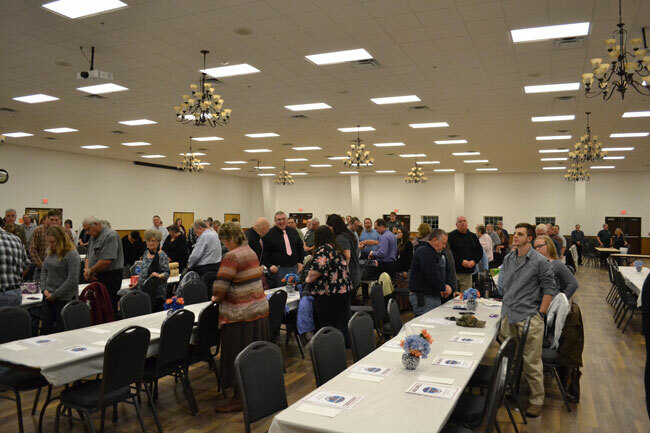 Through a wintry mixture of sleet and snow, locals from around the Catoctin Area poured into the Thurmont Event Complex to show love and support for the Thurmont Ambulance Company during its annual banquet on January 18, 2019. Friends, families and volunteers of the Thurmont Ambulance Company braved the icy conditions to honor and recognize the people who dedicate their time and energy to answering calls for help 365 days a year. Food was served, laughs were had, and awards were given for several individuals who go above and beyond for citizens in need around the area. Among those recognized, a few could not make it due to the snowy tundra that blanketed the Catoctin Mountain, but the snow did not stop President Lowman Keeney from reading their names and praising their services in their absence. The Rocky Ridge 4-H Club served the dinner for the banquet, providing everyone with a variety of delicious foods and desserts to accommodate even the pickiest of eaters. The lines for food piled up, with guests collecting around the mashed potatoes, green beans and fried shrimp. As the 4-H kids made their rounds providing refills and entertainment for guests, President Keeney took the stage to bring attention to the banquet and give thanks to all who made the event possible. As everyone began to settle in, bellies full and eager for things to begin, Keeney started with introductions and a welcome. Many people had and continue to have a helping hand in making the Thurmont Ambulance Company the smashing success that it is, but Keeney identified a few key players who make the company what it is today. Chief Dennis “DJ” Ott, Judy White, Joyce Stitely, Dennis Ott, Sr., Jim Wolf, Shirley Stackhouse and the company’s top responder Jenn Frushour all got special thanks among several others for the work and efforts made for the ambulance company. Across all members, 46 responded to calls in 2018, providing Catoctin Area residents with fire and EMS aid at all hours of the day. Of the 46 responders, one stood above all others in time dedicated and calls ran. Jenn Frushour clocked 3,872 hours for the Thurmont Ambulance Company, running a remarkable 342 calls for patients. To put it in perspective, across a full year, Frushour logged 10.6 hours per day in total time spent for the Thurmont Ambulance Company. “Our top responder apparently has no life, running 342 calls,” Chief DJ Ott joked. Other top responders include last year’s Chief’s Award winner, Brooke Ott, who ran 201 calls. Hilary Blake ran 128 calls, William Ott ran 62 calls and Chris Pigula ran 55 calls. The ambulance company responded to 1116 EMS, 50 fire and 92 non-emergency calls over the course of 2018, continuing to stay busy each and every day. “We had an average response time of seven minutes,” Chief Ott said. “Ideally, we’d like to get that to five, but that’s something we’re working toward.” With an average response time of seven minutes and a total call time of 87 minutes, it’s easy to see just how much time some of the staff and volunteers are pouring in to help the community. “We have a great group here, but we’re always looking for more help and more EMTs,” Chief Ott said. Venture Crew 270’s presentation kicked off the awards. The operational awards went off without a hitch despite absences from a few key members. President Keeney presented Dennis Ott, Sr. with the President’s award, highlighting his contributions to the community of Thurmont and all its people. “He takes an hour to get from Thurmont to Emmitsburg, but he’ll always be there for you,” Keeney joked. A memorial service soon followed in honor of two close members who passed away in 2018 and made a significant impact over the course of their lives. Two candles were lit by Shirley Stackhouse for the memorial service to symbolize the eternal place Russell “Lee” Fisher, Sr. and Diane Oxendale have with the Thurmont Ambulance Company. Fisher passed away in April of 2018 and Oxendale passed in June 2018. 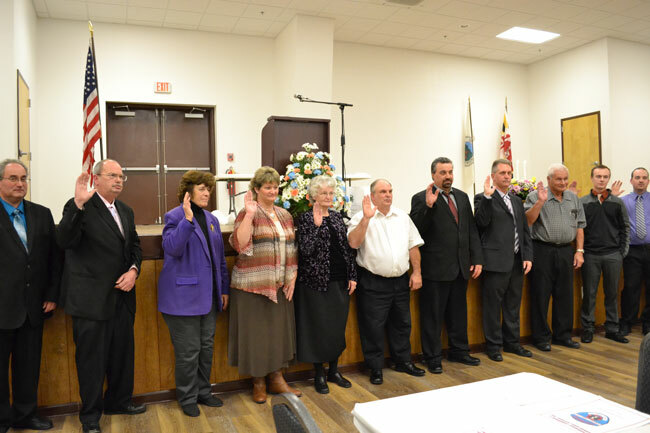 After a moment of silence and a prayer for those we’ve lost rang through the Thurmont Event Complex, the focus shifted to the naming of the 2019 administrative and operational officers. Lowman Keeney, Dennis Ott, Sr., Judy White, Glenn Muth, Joyce Stitely, Shirley Stackhouse, Tim Wiltrout, Jim Wolf, Jim Humerick, Dennis Stitely, Cole Mercer, Dennis “DJ” Ott, Jr., Jenn Frushour, Brooke Ott and Renae Coolidge were all named officers for the new year. Congrats to all current officers on their positions protecting and serving our community. The 4-H Club members made their rounds once again, handing out raffle tickets to everyone in attendance, with the crowd eagerly awaiting to hear their ticket called to get one of several awesome prizes. The ambulance club had gift baskets filled with fruits, several bottles of wine and gift cards to a select few lucky winners. 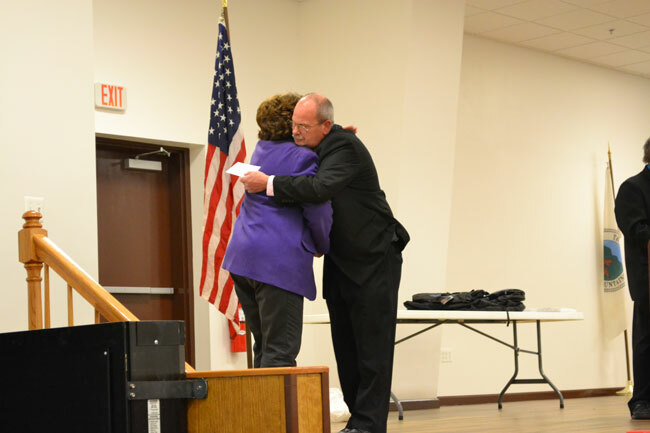 The raffle wrapped up the event and capped off another successful Thurmont Ambulance Banquet, but each speaker made it clear that the contributions made by those honored do not go unnoticed or unappreciated. A sincere thank you goes out to all EMS providers in the area for your service and dedication. Without your time and efforts, our community would not be the same. Fifteen members were appointed as 2019 Administration and Operational Officers. Administrative Officers include President, Lowman Keeney; Vice President, Dennis Ott, Sr.; Treasurer, Judy White; Asst. Treasurer, Glenn Muth; Secretary, Joyce Stitely; Asst. Secretary, Shirley Stackhouse; Directors, Tim Wiltrout, Jim Wolf, Jim Humerick, Dennis Stitely, and Cole Mercer. Operational Officers include Chief, Dennis Ott, Jr.; Asst. Chief, Jenn Frushour; Lieutenant, Brooke Ott; and Sergeant, Renae Coolidge. (above, right) Despite the wintry weather, a significant crowd attended the annual banquet. (left) One of many awards presented, Dennis Ott, Sr. presented an award to Judy White. 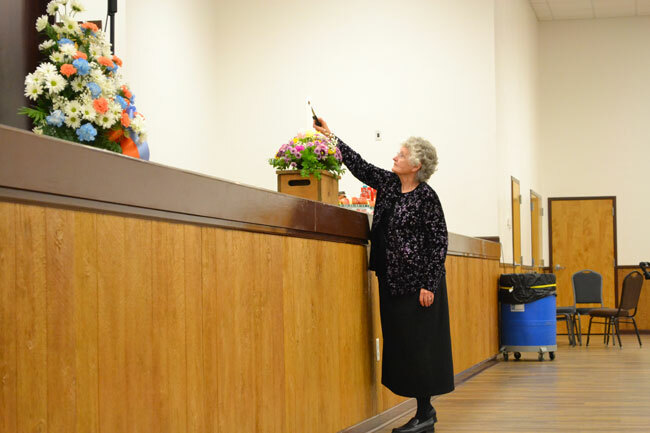 (right) Shirley Stackhouse lit two candles in memorial of Russell “Lee” Fisher, Sr. and Diane Oxendale.